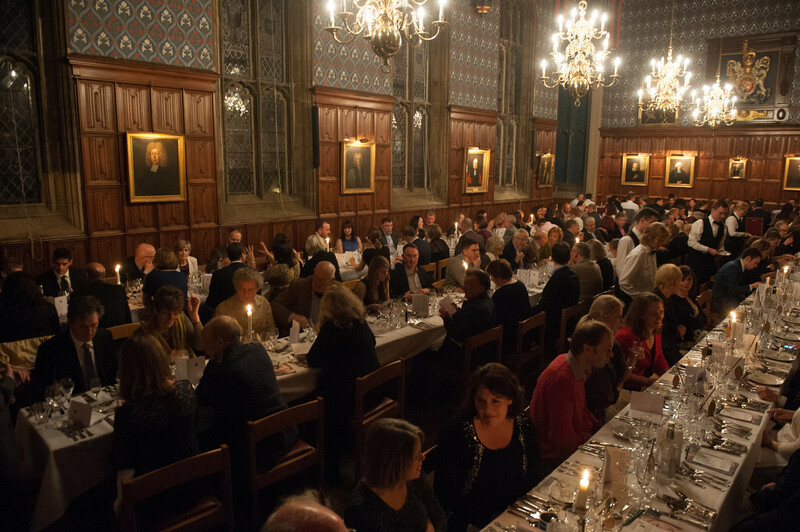 Corpus Christi opened its doors to the public for a shared dinner event on the 11th September 2015. The evening started off with a drinks reception on Old Court lawn, followed by a delightful three-course meal with tea and coffee in our wonderful dining hall. A big thank you to all the staff and students that helped make the event such a success! 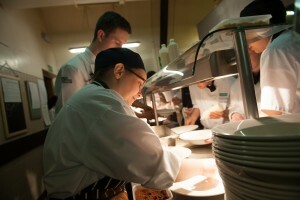 146 guests, 60 helpers, 16 different fish, 876 glasses, 2044 pieces of cutlery, 1650 portions of food, 1 great cause! Following on from the highly successful Dingley Dell Flying Visits Pork Feast in 2013, which raised £7,500 for the NSPCC, Chris Le-Vien (Catering Manager) and the team at Corpus decided to embark on an even more extravagant charity event: a seven-course Fish Feast. On Saturday 21st March the team pulled out all the stops for an evening of mouth-watering dishes and carefully selected wines. 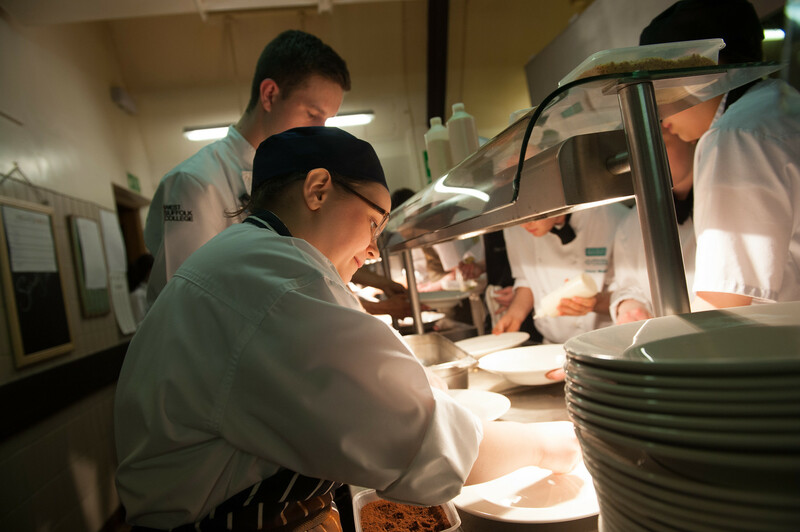 Each course was put together by an award-winning chef or industry expert, ably assisted with preparations and plating up by a team of apprentice chefs from selected colleges around the country. The evening began with wine and canapés, created by infusion4chefs, followed by a short introduction with tales from the UK fishing industry, presented by Michael Buchan, a skipper for Marrfish. Together with Barry Bentley and Alice Larkins from Colchester Institute, Russell Bateman (Colette’s Restaurant) produced the first course: oyster panna cotta, scallop & apple tartare and chilled celeriac consommé. 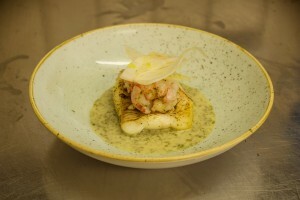 The second course – grilled plaice, langoustines, fennel and cucumber – was carefully constructed by Mark Poynton of Restaurant Alimentum. Olivia Scarfe and Kieran Wallbank from Milton Keynes College were by his side to lend a hand. Due to work commitments, Steve Smith (Bohemia Restaurant) was unable to attend the evening. Luckily, our very own Chris Le-Vien stepped in and created a dish that proved a favourite amongst quite a few of the guests – curry-cured salmon and charred cucumber with a cucumber & ginger sorbet. Chris was supported by Joshua Gibb and Connor McFarland, both from Mid-Kent College, as well as Matt Dakin, Junior Sous Chef at Corpus. Next up was Phil Thompson, the owner of THOMSPON@Darcy’s, assisted by Joshua Phillips and Sam Sturman from West Suffolk College. 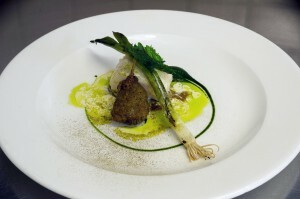 Together they created a fabulous dish of poached hake fillet, crisp frog’s leg, creamed nettles and onions. 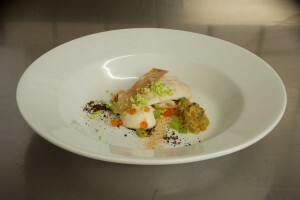 Matt Gillan from the Pass Restaurant created the fifth course: flounder, mussels, almonds and cauliflower. This complex dish consisted of twelve different elements, but with the help of Ashesh Purja and Aidan Rogers from Eastleigh College, Matt was able to pull this off and score another success amongst the guests. The feast’s final savoury dish – cod, grilled white asparagus, fermented white asparagus, charcoal and truffle – was produced by Adam Simmonds (overseeing the menus at The Pavilion in High Street, Kensington) supported by Andrew Sung and Boyeon Kim from Westminster College. By far the most difficult challenge of the evening was given to our very own (and very brave) Executive Head Chef, James Circuit, who worked with Kevin Beckett and Michal Hul from Cambridge Regional College to create…a fish course dessert. James and his team devised a stunning beach-themed dessert that included coconut crémeux, brandy snap, lime foam, squid-ink sponge, samphire and shortbread. Every guest was positively fit to burst by this point – but we weren’t finished yet. The front-of-house team, which consisted of students from various colleges, served tea & coffee with a selection of petit fours, such as honey lavender & rhubarb, strawberry & thyme, smoked whiskey chocolate and spiced mango. Murray Chapman from Passion2Inspire headed up this team, ably assisted by Panteleimon Bazinis and Simon Kirkham from Cambridge Regional College. We would like to thank the following suppliers who kindly donated towards the evening’s proceeds, helping to increase the donation to the NSPCC to a grand total of £9139.62: Anthony Byrne Fine Wines, Raynor Foods, Diversey, Fisher & Wood, Sherringhams, 3663, Town & Country, Select Recruitment, Workshop, Cheese+, Blunham Dairies, Liquidline, Mash Produce, Sparshotts Fruiterers and Swiss Laundry. Finally, special thanks must go to all the amazing chefs, staff and students for giving up their free time for such a worthy cause and helping to make the evening such a success. It was a pleasure to host this wonderful event with so many brilliant people…here’s to the next one! The Open Cambridge Dinner, which took place on Friday 12th September 2014, proved to be another huge success. We received some wonderful feedback from guests, some of whom had travelled from as far afield as Australia to be here. The evening started off with a champagne drinks reception on Old Court lawn, followed by a delightful three-course meal with tea and coffee in the College dining hall. The evening was rounded off by the Parker Library’s Dr Christopher de Hamel, who gave a brief talk about the College, its chilling ghost stories and its fascinating collection of historical documents. We would like to thank all our guests and staff for making the evening such a success, and we look forward to welcoming you back in the future.